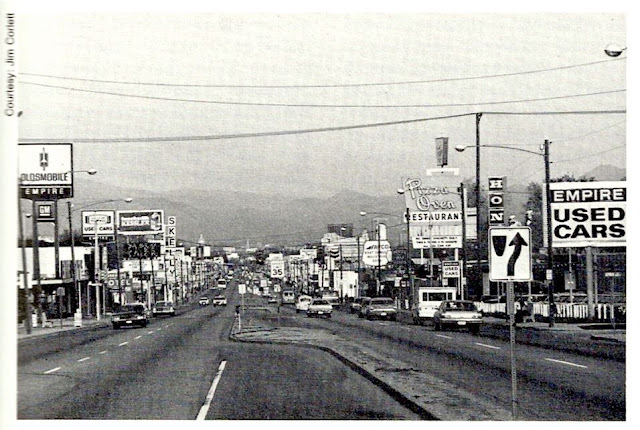 "During the boom years of the 1940s and 1950s along the business barometer of East Colfax, where the Baron von Richthofen once planted his Elms, change was most evident. The elm trees were cut down and the concrete corridor was fattened. Many of the substantial old homes that once made East Colfax a fashionable residential district had undergone ingenious transformation, reappearing as shops selling everything from tropical fish to false teeth, from books to caskets. Above all, Colfax became an ode to the automobile, a gasoline alley of service stations and car lots.